A colored universal indicator/oscillator based on crossing moving averages. The rising and falling lines of the indicator histogram can be colored. The combined use of the line and the histogram increases the level of the analysis when making a decision to open or close deals. The bullish line of the indicator - buffer 2, must not be equal to 0. The bearish line of the indicator - buffer 3, must not be equal to zero. The bullish line of the indicator histogram- buffer 0, must not be equal to 0. The bearish line of the indicator histogram - buffer 1, must not be equal to zero. 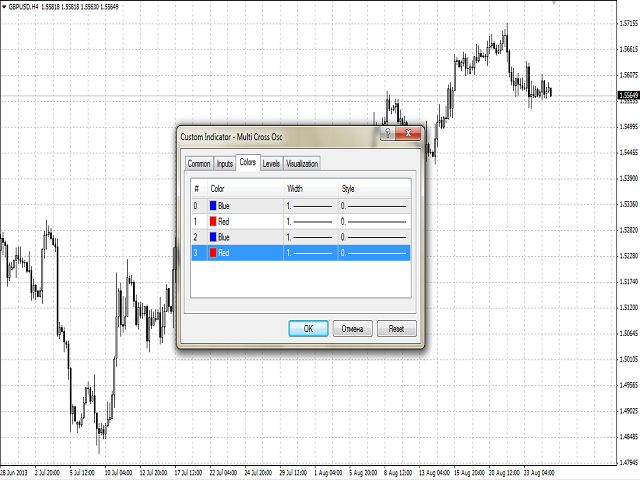 Calc_Method - the index of the indicator, based on which the Multi Criss Osc indicator will be calculated (from 0 to 11). By default, i.e. more than 11 - the standard Price Oscillator. 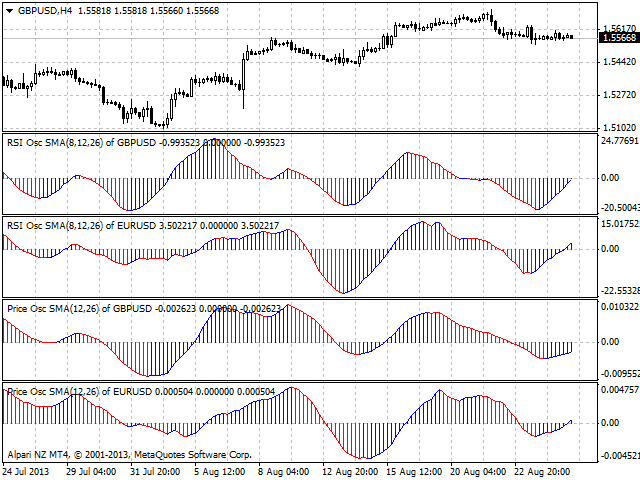 Periods - the period for calculating the basic indicator, based on which Multi Cross Osc will be calculated. Mode - the index of the line (MAIN - 0 or SIGNAL - 1) of the basic indicator, based on which the Multi Cross Osc will be calculated.